Brokk, the world’s leading manufacturer of remote-controlled demolition machines, launched four new machines during INTERMAT Paris 2018. The new models include: the Brokk 170, Brokk 200, Brokk 300 and the green diesel Brokk 520D machines. Each of the four models comes equipped with Brokk’s signature SmartConcept technology. Along with the launch of the new line, Brokk also introduced new attachments, including BHB hydraulic breakers and three Darda concrete crushers. The 3,527-pound (1,600 kilogram) Brokk 170 offers 15 percent more breaking power than its predecessor, the Brokk 160, with a 24-kilowatt SmartPower electric powertrain. The machine delivers 299 foot-pounds (406 joules) with each blow of the Brokk BHB 205 hydraulic breaker and maximizes the crushing force of the Darda CC440 crusher, designed specifically for the B170. The new model maintains the same compact dimensions of the Brokk 160, for ultimate flexibility in limited access and confined spaces. Defining a new weight class for demolition robots, the Brokk 200 fills the gap between the Brokk 170 and the Brokk 300. The new model leverages SmartPower technology to pack the power of a 6,834-pound (3100-kilogram) Brokk 280 into a 4,629-pound (2,100-kilogram) package. The 27.5-kilowatt machine operates attachments typical of robots one weight class higher. When paired with the new Brokk BHB 305 breaker, the unit’s hitting power is increased by 40 percent over its predecessor, yet the Brokk 200 retains the same 31-inch width for easy access through standard doorways. The Brokk 200 offers 15 percent longer vertical and horizontal reach –over two feet more than the Brokk 160 – while retaining most of the compact dimensions. The extra chassis length and machine weight ensures proper balance, even when wielding heavy attachments. The Brokk 200 is ideal for heavy-duty, difficult-to-access projects and applications and represents the new gold standard in compact remote-controlled demolition power. The all-new 8,047-pound (3,650-kilogram) Brokk 300 replaces the Brokk 280. Again, because of the unit’s exceptional power-to-weight ratio, it boasts 40 percent more hitting power than its predecessor, when paired with the Brokk BHB 455 breaker. Brokk developed the 300 with the new generation of SmartPower technology, which increased power output to 37-kilowatts. This allows the machine to deliver the hydraulic flow and pressure to fully power heavier and more powerful attachments. Although the Brokk 300 is slightly longer than the Brokk 280 and 1,102-pounds (500-kilogram) heavier, it retains the same width and height, making it ideal for confined work sites. A new arm system increases vertical and horizontal reach to 21.3 and 20 feet (6.5 and 6.1 meters), respectively. The Brokk 520D establishes a new standard for diesel-powered demolition robots. When combined with the BHB 705 breaker, the unit offers 40 percent more hitting power than the Brokk 400D it replaces. This eco-friendly 12,125-pound (5,500 kilogram) machine comes with a diesel Stage 4/Tier 4 Final Kohler engine meeting the new EU and North American emission standards. The new machine is slightly heavier and longer than the Brokk 400D, boasting a bigger BHB 705 breaker and nearly a foot longer working reach longer work reach (.25 meters). Its heavier-duty boom system and increased hydraulic performance means it can handle the same wide range of heavy, powerful attachments available for the Brokk 500 released last year. Incorporating Brokk’s SmartDesign, the Brokk 520D will simplify daily maintenance and increase machine uptime. 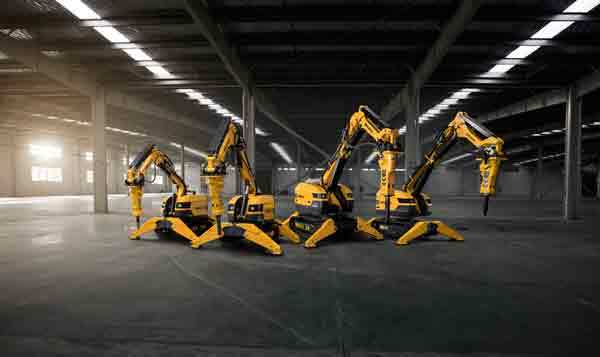 These four new demolition robots from Brokk reflect the company’s constant focus on innovation, improved performance and increased uptime for customers around the world. Each of the new machines combines state-of-the-art technology, significant improvements in power-to-weight ratios and rugged reliability. Brokk begins shipping the new models in August/September 2018.